Sometimes inspiration for my writing comes from other moms asking for advice. Recently I was asked for my thoughts on introducing responsibility and allowances. I am not an expert on this stuff and while family values differ and what works for each child may be different, I love to share what works for my family knowing it might help others find their own path. I started teaching Chase some money basics when he was in pre-school and wrote about it in my blog post: Teaching The Value of Money & Other Life Lessons. Once he reached an allowance appropriate age, I moved to a simple chore chart to offer more responsibility and the opportunity to make a regular earning. Before implementing chores for an allowance, I think you should consider how you will differentiate between basic daily expectations and what constitutes an earning. When Chase was younger, we used a Melissa & Doug responsibility chart to encourage some positive behaviors like sharing, kind words and to establish some basic daily expectations. Earning a magnet on a chart was a huge reward as a preschooler and was a great way to start establishing his routines. Now without reward we expect our kids to pick up toys at the end of every day and to tidy their room once a week. We expect them to help set the table and put their plates in the sink after eating. Since school has started, I expect Chase to carry his things from the car into the house, hang his coat, put his shoes away and empty the contents of his lunch bag and school bag in the kitchen. Everyone who lives in our house has to contribute. We work as a team to take care of our home for ourselves and our family. The daily expectations you set will be reflective of your family’s values, your childs maturity level and capability. While it takes some time and effort to teach these routines and many reminders to help form them as habits, in the end the effort will be worth it! Chase has a strong sense of independence, responsibility and I love to see his self confidence shine when he accomplishes his tasks. While I don’t exactly support child labor, these expectations do take a load off you as a parent, especially when there are other little’s to take care of. At the Dollarama I found a small magnetized white board divided into 7 blocks labeled by the days of the week. I used a pretty patterned washi tape to divide the weekly blocks on the whiteboard into an upper and lower section. I also picked up a pack of 7 round magnets which I covered with pretty paper and wrote age-appropriate chores on them. We place all the magnets in the upper section of the blocks and once completed, move them to the lower section. Once all magnets have migrated south of the washi tape, an allowance has been earned! At first we started with the intention of a chore a day and weekly allowance, but now we disregard the days of the week and instead allow chores to be completed as time and motivation allows. This works better for us having a busy schedule. Some days even I cannot complete one chore! When Chase is especially motivated, he will power through several chores back to back and then on less busy weeks, will take on a chore per day which is reasonable for his age. As much as structure is necessary to establish good routines, I do believe you have to bake flexibility into your plan or it won’t bend with your lifestyle and you’ll give up on the routine. Our 7th magnet is used like a wild card so I have some leverage in encouraging him to complete a random job that I need help with. While some of these chores are completed independently, others require my support. Believe it or not, this is quality time that Chase has come to appreciate. There are teachable moments when you do chores together and some of our best chats are when we are sitting on the floor matching socks and folding laundry. The whiteboard I used happened to have a small strip of corkboard so I used snack size zip lock bags to pre-bag an allowance made up of quarters to total $2.50. These bags hang off the corkboard strip so he can keep his eye on the prize. 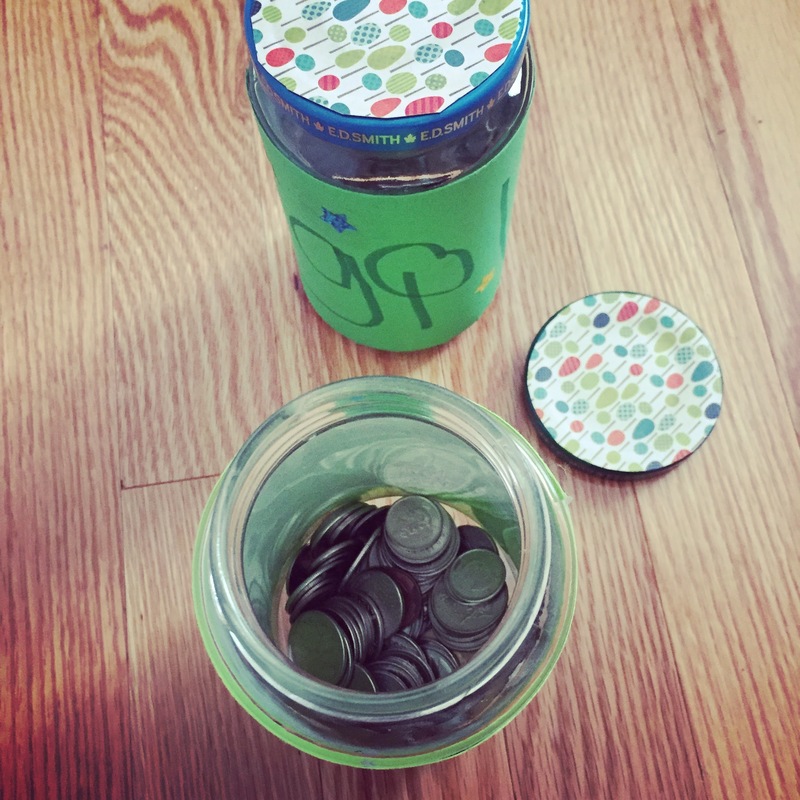 One of the routines I built into our original practice of money charting, was using spend, save and give jars. This has been an important part of allowing Chase the freedom to appreciate his earnings for an immediate reward, plan for his future goals and encourage charitable giving. We offer his allowance in quarters for ease of distribution between the jars. Explain how when the needs are paid for, leftover money can be used for wants i.e. trips to the zoo, special outings etc. Let your kids decide what charity is meaningful to them and have them give their money from the donate jar. Make a big deal about it so they feel good about charitable giving. I like the ideas. We use similar methods in our home with Spend, Save, Share jars as well. My son is 10 and we have agreed on a $5 allowance at this time per week. But he also has other opportunities to earn money. Example is if he puts in the effort to sort the recyclables and help me take them to the car and down to the depot, I allow him to keep the $ earned back. When I give him his allowance, I tell him he must put some of the $5.00 in each jar- how much goes in each is up to him. But anything extra he earns outside of his allowance can go in any jar he chooses. I have been pleasantly surprised at how easy it has been for Noah to “but into” the chores for allowance plan! It is working really well for us and I encourage all families to incorporate something similar. It has taken Noah a long time to save for a big ticket item he wanted, but he has learned that the value of a dollar saved for something really important vs a dollar wasted on junk, and I think that lesson above all is important. Not to mention the benefit of learning life skills by taking care of your belongings, home and each other. ?